Published by Pauline Pontois 5 October, 2017 in Trade and industry group. The activities organized by Go Science have started for this semester. Go Science is a collaboration between the University of Gothenburg, Chalmers University of Technology and Göteborg & Co, Trade and Industry Group. 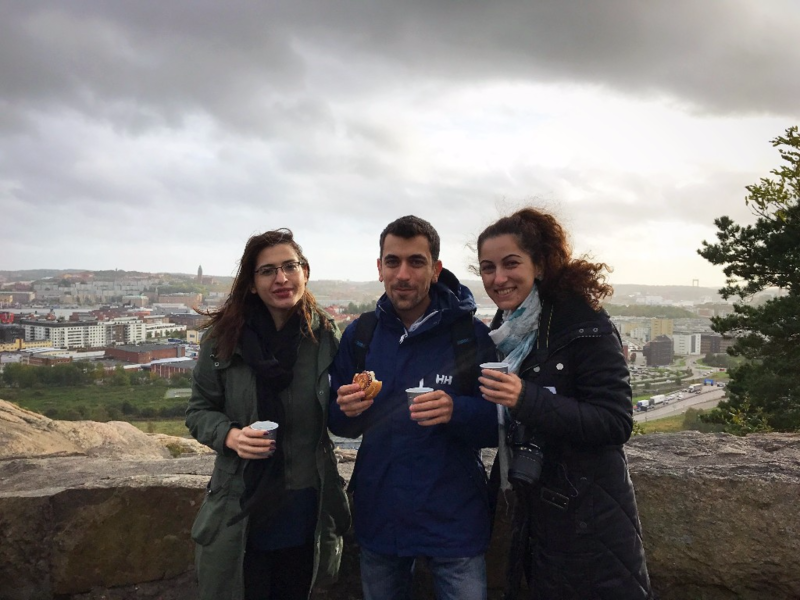 In order to welcome the newly arrived international researchers to Gothenburg, Go Science organizes every semester different activities where everyone gets the chance to discover the city and meet other fellow researchers. On October 3rd the fall activities started with a city tour to discover Gothenburg. The international researchers were given the opportunity to learn more about the history of the city and where Gothenburg is heading for its major urban development and 400th Anniversary in 2021. 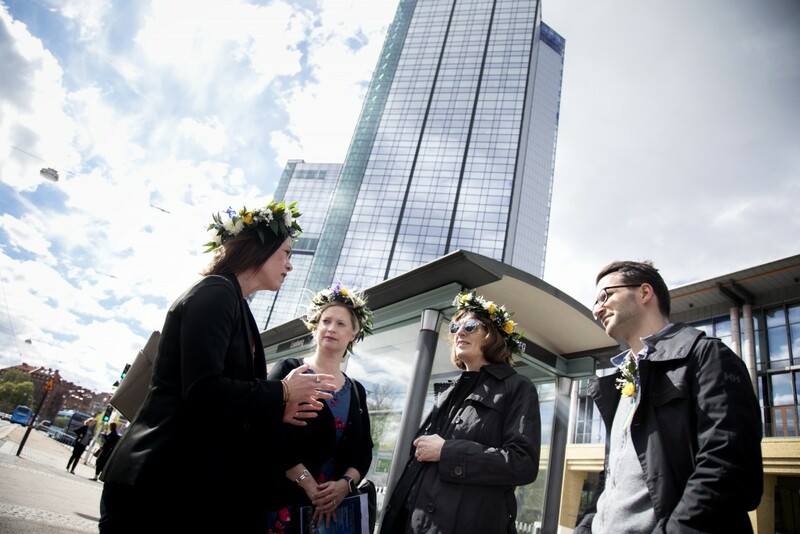 The trip took the researchers to central Gothenburg as well as outside the city center, including Linnéstaden, Masthugget, Klippan and Hisingen with a stop at Ramberget to get a view of the whole city. The activities will continue throughout the fall semester with museum and company visits as well as a traditional Lucia celebration in December. See all activities here. Published by Charlott Holmåker 4 October, 2017 in Destination. Foto: Charlott Holmåker/Göteborg & Co. Eight international design bloggers from Germany, France and the UK recently visited designer tourist destinations in Gothenburg. All the bloggers have high profiles in their own countries, but also reach international audiences. 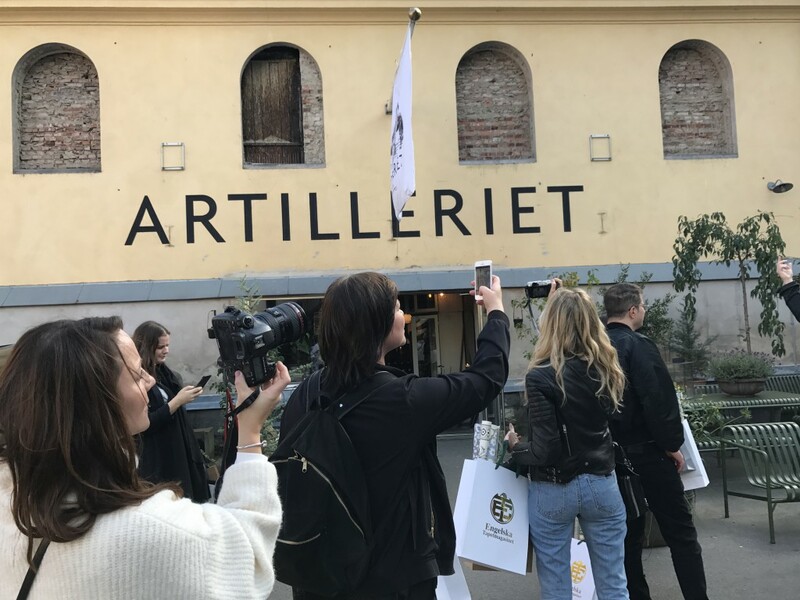 The locations they visited in Gothenburg included Rum21, Engelska tapetmagasinet, Norrgavel, Floramora & Krukatös, Artilleriet and the Artilleriet kitchen, Da Matteo and Grandpa. The bloggers were impressed by the programme and took lots of photos, asked numerous questions and were very enthusiastic. “I found it very inspiring to be here. It’s a great programme with lots of fascinating people, and it’s good to get an insight into the Swedish design world. I think it’s different from Norwegian and Danish design, which I’m very familiar with. My impression is that Swedish design is a mix between the pared-back style of Danish design and the cosiness of Norwegian design, and that it also welcomes the use of black,” says Camilla Jorddal from Norway. Following their visit to Gothenburg the bloggers moved on to Borås and Lidköping. Published by Charlott Holmåker 3 October, 2017 in Destination, Meetings. Clarion Karlatornet, Scandic Landvetter, Liseberg södra entrén and HKC Åby. Foto: Pressbilder. Over the next few years there are plans to open several new hotels in and around Gothenburg, creating over 3,000 new hotel rooms. Those hotel rooms will be needed, as almost all the hotels in Gothenburg were fully booked this summer. The opening dates for the new hotels vary. HKC Åby will be the first, with 220 rooms planned for completion in 2019. 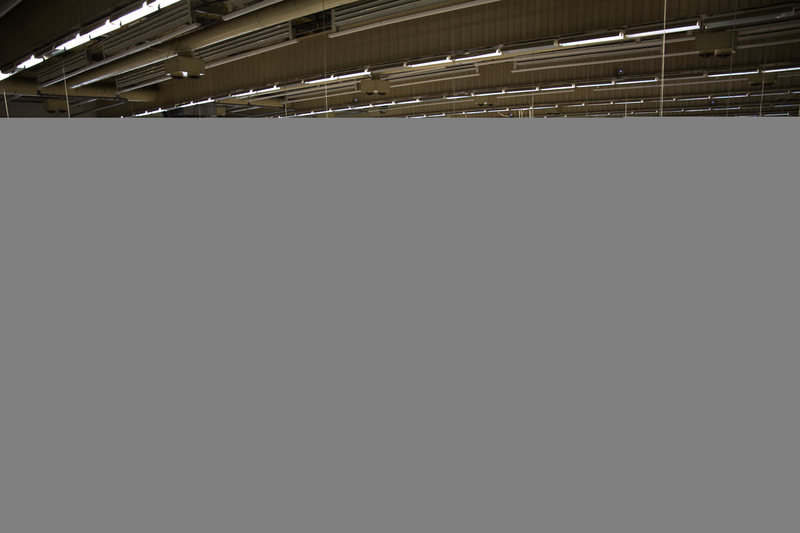 This will also house a new exhibition centre with an area of around 15,000 square metres. It will be followed by a number of new hotels that are due to open in 2020 and 2021. In addition to the new hotel rooms, several of the hotels will also provide meeting and exhibition facilities. In summer 2017 the existing hotels in Gothenburg had a occupancy rate of just over 80 per cent, which means that they were effectively fully booked. For Sweden as a whole the hotel occupancy rate during the same period was 67 per cent. Due to open in 2020, the Folkets Hus/Draken hotel will have 400 rooms, the Scandic Gullbergsvass 360 rooms, and the Scandic Landvetter airport hotel 200 rooms. In 2021 Liseberg amusementpark will open a new hotel near the south entrance providing 450 rooms, while the Nordic Choice Mölndal will create 370 rooms and the Clarion Karlatornet 300 rooms. 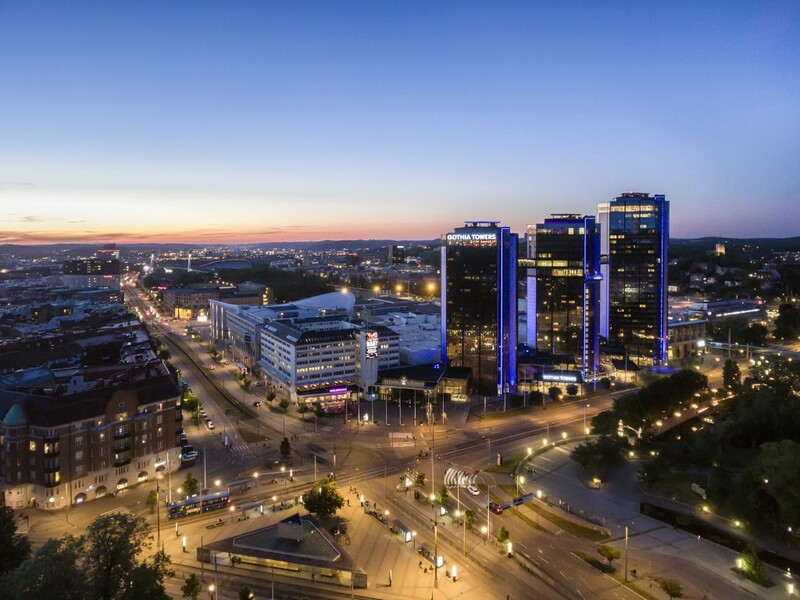 The Swedish Exhibition & Congress Centre and Gothia Towers are also planning to build two new hotels with 500 rooms and 300 rooms respectively, but the completion date has not yet been set. Right now, in autumn 2017, around 900 square metres of new conference and event space is being completed at the Elite Park Avenue Hotel. The hotel is expanding towards the Lorensbergsteatern theatre. The existing conference space is also being renovated, new hotel rooms are being built and existing rooms are being refurbished. Published by Pauline Pontois in Trade and industry group. On December 2016 Gothenburg was welcoming the European Championship in vocational skills EuroSkills. The event supported by Göteborg & Co, Trade and Industry Group attracted over 65 000 visitors. 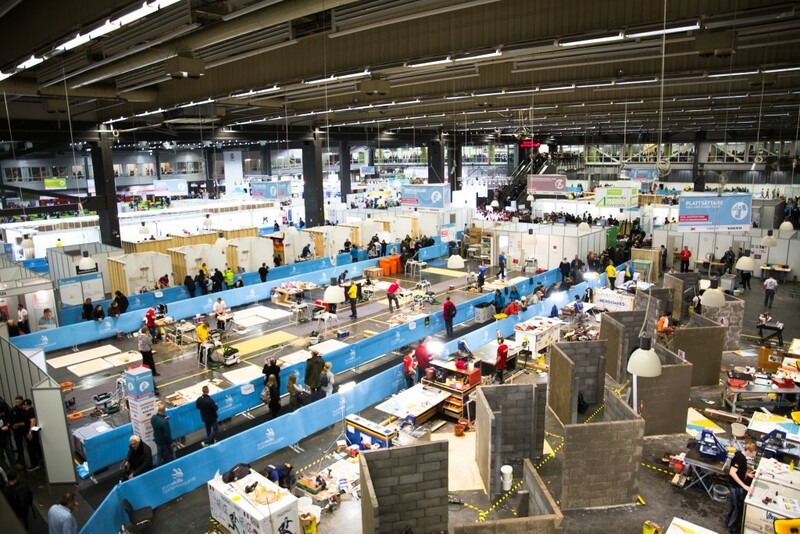 Just over a year later, the legacy of EuroSkills, Future Skills, will be held on October 10th-12th at the Swedish Exhibition and Congress Centre during the yearly event for elementary school students, High School Days Fair (Gymnasiedagarna). Future Skills is the new meeting place of High School Days Fair. It is organized by the region of Gothenburg GR Utbildning in cooperation with Göteborg & Co Trade and Industry Group, Business Region Göteborg, Västra Götalandsregionen, and the Swedish Employment Agency Arbetsförmedlingen. The goal of the event is to create a new arena where young students get the chance to talk directly to companies and organizations, as well as professionals in the business they’re interested in. Future Skills is primarily aimed at elementary school students from grades 8th and 9th, but jobseekers and adults students at SFI are also welcome. Visitors will have the opportunity to meet representatives of colleges, academy, foreign studies, as well as try different professions and learn more about the industries. “Future Skills is a lot about gaining inspirational knowledge on which skills will be demanded from specific business. Make sure to discover your talent at Future Skills!” says Lena Sjöstrand, project manager at Göteborgsregionen kommunalförbund for Future Skills. Tagged with EuroSkills, Future Skills, Gymnasiedagarna. Published by Pauline Pontois 28 September, 2017 in Trade and industry group. On Thursday 14th September, Gothenburg welcomed approximately 800 new students during a welcoming ceremony at the Museum of World Culture organized by Student Göteborg. 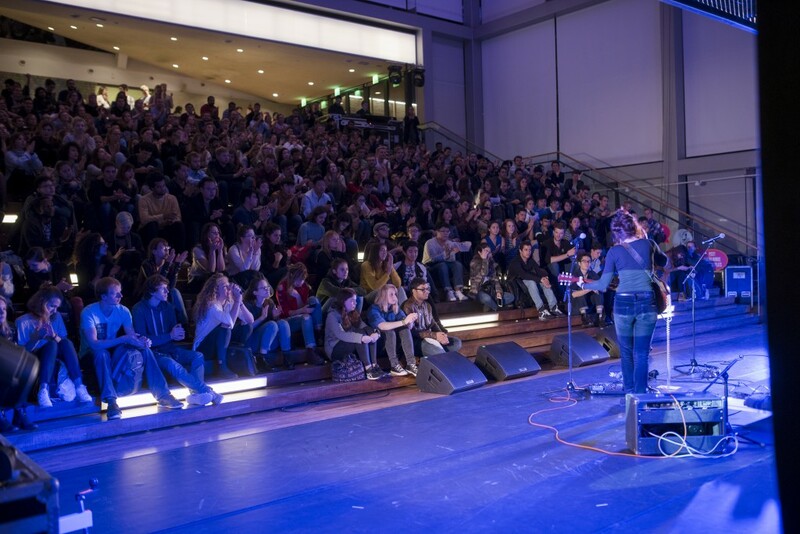 Student Göteborg arranged a fully-packed evening where new students got the chance to participate to many activities. Live music with the band Slowgold and DJ Lovefuck gave tempo to the evening. Student could even attend a dance performance from The Göteborg Opera, screenings, workshops, exhibitions, and much more. All in all, it was a successful event. “We are proud and extremely pleased to present such a wide and interesting range of content on our welcoming ceremony. We had new activities this year with screenings from Draken Film, Ted Talks, popup store from Emmaus and many exhibitors as well as two conference delegates. It almost felt like Student Göteborg had its own festival!” said Nathalie Bödtker-Lund, project manager at Göteborg & Co for Student Göteborg. 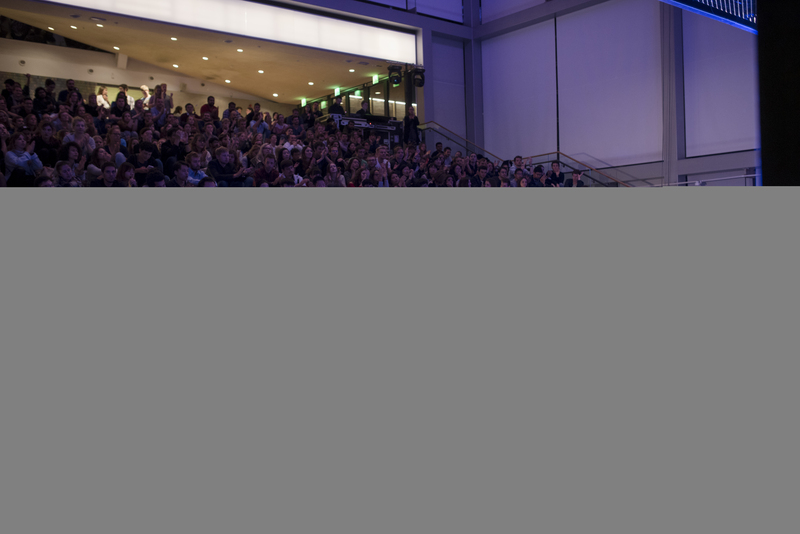 Gothenburg welcomes around 13.000 new students each semester. Student Göteborg has organized welcoming activities and created meeting places among national and international students since 2006. Student Göteborg is a campaign from Göteborg & Co Trade and Industry Group in collaboration with the University of Gothenburg, Chalmers and the student unions. “The students have to feel welcome, included, safe and inspired to come to Gothenburg,” said Nathalie Bödtker-Lund. Many activities are organized during the semester. See the entire program here. During the summer 2017, Göteborg & Co Trade and Industry Group contributed to the cultural life of Gothenburg in different ways. The Group supported the concert of the Lebanese artist Nawal El Zoghbi during Gothenburg Culture Festival, but was also involved in other cultural activities and performances in several districts of the city. A recurring theme this year was “culture and youth”. 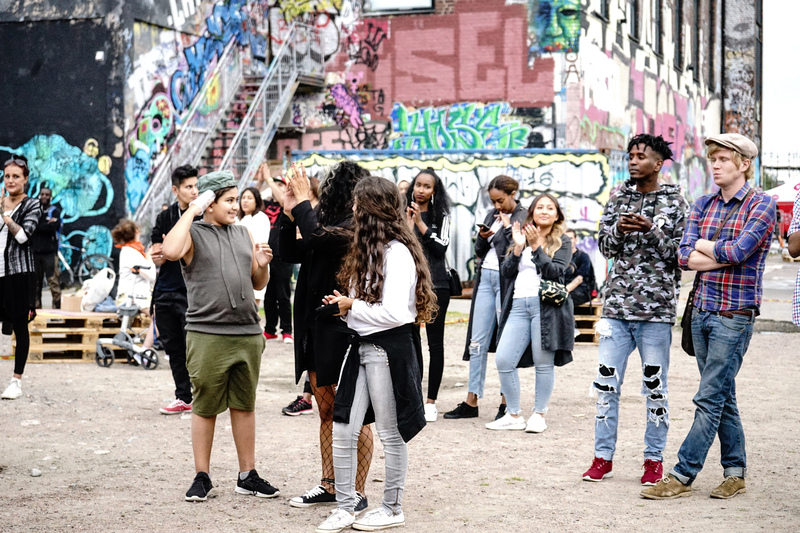 The project Kultur 4ür Göteborg aims to work for a strong and fair cultural life in the city and fight youth segregation. Participants who were between 14 and 20 years old got the opportunity to perform on different stages. The festival was organized between June 14-21st and spread in seven districts of the city. In total, the festival gathered 5.000 people in the audience. ”The event has been very successful. 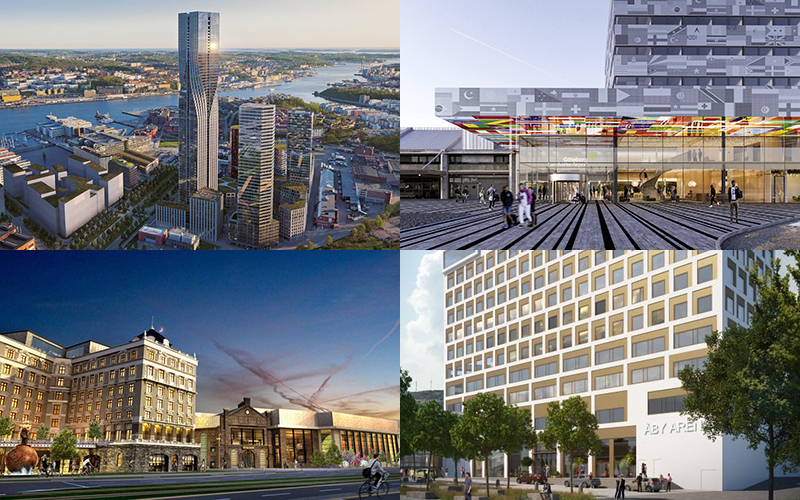 The business evolved so much that similar projects started to grow in the region.” said Kalle Karlsson, the project leader for Kultur 4ür Göteborg. As part of the project Creative Places in Biskopsgården, the organization MEETING PLAYS conducted the show “Summer Theater Biskopsgården”. 14 participants, all of them from the district Biskopsgården and who had just graduated from 9th grade, created and performed a theater performance with the help of professional artists. They wrote their own texts and music as they reflected on the theme “money”. Thanks to this project, most of the young participants got the chance to perform live for the first time. A hiphop festival arranged by the association GBG HipHop took place on August 17th in Röda Sten. The festival invited the audience to experience hiphop culture as a whole with music, competitions, workshops, art and performances. 30 artists and about 500 visitors participated to this successful event. “We are very pleased with the event and with the fact that we managed to get many associations and organizations involved in the festival,” said Robinson Rivera, project manager for the GBG HipHop Festival. Published by Linda Nordberg 15 September, 2017 in Meetings. On 17–21 September 2017, Gothenburg will host the European Conference on Optical Communication (ECOC). This will be the 43rd conference in succession and is the largest conference in Europe in the field of optical communication. This year, for the first time, the conference will be environmentally certified. This is the third time ECOC will be held in Sweden, and the second time at the Swedish Exhibition & Congress Centre in Gothenburg. The conference is an opportunity for over 1,000 researchers and product developers to catch up on leading research achievements and scientific discoveries in the field of optical communication. A large exhibition will take place in parallel with the conference and is expected to attract up to 5,000 delegates from around the world. In an effort to reduce environmental impact the organisers of this year’s conference have for the first time chosen to environmentally certify the conference to Swedish Environmental Base (Svensk Miljöbas) criteria. This is an important part of the city’s environmental profile, since Gothenburg is ranked as one of the world’s leading destinations for sustainable meetings*. A number of the measures that led to environmental certification focus on catering. The ECOC organisers have for instance chosen to serve fish that is fished sustainably (MSC labelled), fewer meals contain meat and there is always a vegetarian option at lunchtime. All coffee and tea that are served are organically sourced and Fairtrade labelled. All sandwiches have at least two organic main ingredients. The organisers are also buying credits to partially offset travel by the delegates to and from Gothenburg. Because the conference venue – the Swedish Exhibition & Congress Centre – is located close to the city centre, visitors can easily walk to hotels and social events, and thus avoid the environmental effects of transport. Conferences generally have considerable environmental impact. Environmental certification is encouraged by the city and helps to promote the development of sustainability efforts. It is hoped that more conferences will follow the same route and choose environmental certification as a way of making an effective difference and contributing to global sustainability goals. ECOC 2017 is organised by Chalmers University of Technology, the Technical University of Denmark, RISE Research Institutes of Sweden Acreo, Telia and Ericsson. The conference organiser is Sweden MEETX. * GLOBAL DESTINATION SUSTAINABILITY INDEX 2016. Read more. Published by Charlott Holmåker 6 September, 2017 in Meetings. Steampipe Production Studio AB/Göteborg & Co.
“I love the city, it is so nice, I will definitely return in the future and I sincerely hope Kenes will be able to host more congresses in Gothenburg in the future.” This was the comment of Marlies Steinebach, Global Director of Business Development at Kenes Group, following Kenes’ visit to Gothenburg. Decision-makers and representatives from key sectors of the global meeting industry visited the city recently and their feedback was very positive. The praise for Gothenburg as a City of Meetings was echoed by INCON. Earlier this year, IAPCO also visited the city, which made a great impression on them. Jan Tonkin, Chairman of IAPCO, was very pleased with their visit. “My overall impression of the congress venue and the hotel and the whole layout of it, are really impressive, an environment I very much would like to hold a meeting in. If I was being asked, why Gothenburg, I think I refer back to the slogan, you have ‘a city made for meetings’”. Published by Charlott Holmåker 28 August, 2017 in Events. 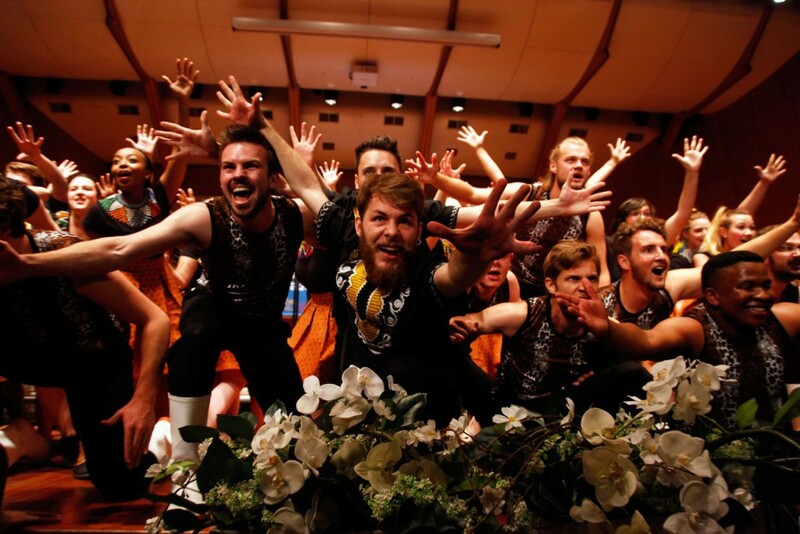 “We are really looking forward to the city being filled with the joy and sense of community that choirs bring, as well as this opportunity to host a high-quality international competition,” says Max Markusson, Events Manager at Göteborg & Co. The choirs will compete in several different classes and styles of music. All age groups, from children to senior citizens, will be represented. The event will include colourful shows, often with a national flavour. Region Västra Götaland supports and promotes choir singing through Körcentrum Väst choir community, and sees the European Choir Games as a great opportunity for the region’s choirs to develop and exchange ideas internationally. Choir singing is the most popular movement in Sweden today and the efforts to bring the event to Gothenburg were part of a deliberate commitment in partnership with Göteborg & Co.
“I hope that many Swedish choirs will want to take part, either as competitors or in the rest of the entertainment programme that will take place during the event,” says Marit Zetterström from Körcentrum Väst. The European Choir Games are supported by Interkultur, which also produces the world’s biggest choir competition, the World Choir Games. The European Choir Games are held every alternate year and in 2019 the fourth series of the games will be hosted by Gothenburg. The event will take place around central Gothenburg at venues such as the Scandinavium arena, Gothenburg Concert Hall and various churches. “Gothenburg is truly the perfect city for the competitors. The hotels, concert hall, churches and great venues are all within walking distance. This will be a fantastic event in 2019,” says Fred Sjöberg, General Artistic Director at Interkultur. 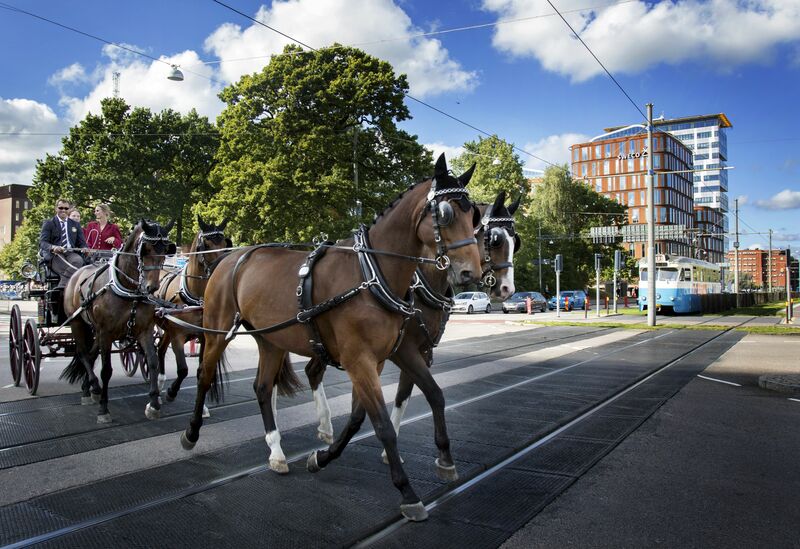 Gothenburg is making Longines FEI European Championships the most sustainable event. Published by Stefan Gadd 22 August, 2017 in Destination, Events. Gothenburg is the top international destination for sustainability according to the Global Destination Sustainability Index. This will be reaffirmed when the city hosts the Longines FEI European Equestrian Championships on 21–27 August. “Our ambitions are high. The goal is to make this one of the most sustainable sports events in Europe this year,” says Katarina Thorstensson, Sustainability Officer at Göteborg & Co. The city of Gothenburg has won several international awards for its efforts to promote sustainability. They include the Global Destination Sustainability Index (GDSI), in which Gothenburg was recently ranked in first place among destinations around the world. This achievement has spurred on the city’s efforts to improve the sustainability of meetings and events. Sustainability was therefore given a high priority during planning of the FEI European Championships. “It covers all three elements of sustainability: social, economic and environmental. 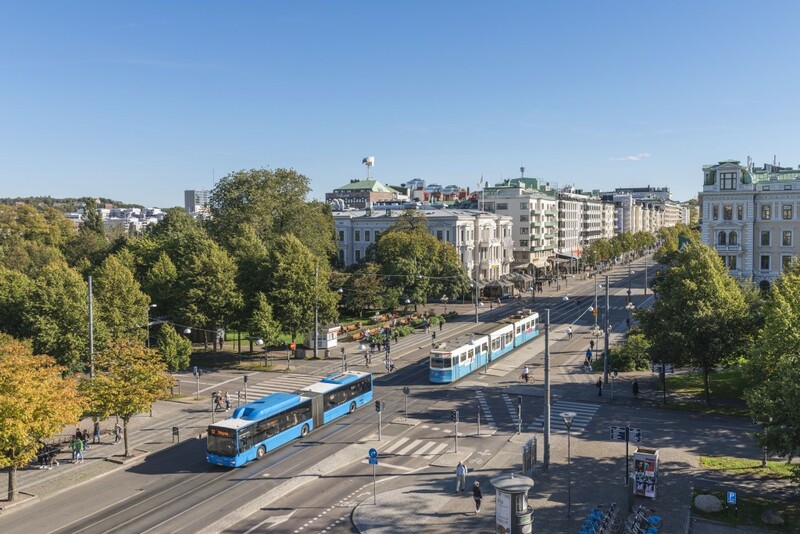 Because Gothenburg already has a strong lead it makes our work easier, for example almost all our hotels are environmentally certified and we can focus on pushing the development of sustainability issues,” says Katarina Thorstensson. Almost all big meetings and events in Gothenburg now gain environmental diplomas, just like the FEI European Championships. August is an eventful month in the city, and both the Way Out West festival and Gothenburg Culture Festival have won awards and publicity for their sustainability efforts. The FEI European Championships will be the third big event of the month. • 86 per cent of hotel rooms in Gothenburg are environmentally certified. • Landvetter Airport has held the highest level of environmental accreditation – “European Airport Carbon accreditation” – since 2011. • 90 per cent of public transport in Gothenburg runs on renewable energy. • There are 1,000 “Styr & Ställ” city bikes to rent at 60 different locations in the city. • In autumn 2013, Gothenburg became the first city in the world to issue a green bond for investments that benefit the environment and the climate. • Gothenburg is a green city, partly thanks to its closeness to forests and parks, but also to the compact layout of the city. Gothenburg is a small city where almost everything is within walking distance. Published by Linda Nordberg 26 June, 2017 in Meetings. When the Prague Convention Bureau held its 6th International Training Seminar at the end of May, it focused on “green” meetings. The seminar, which went under the heading “Green: The colour of future meetings”, invited delegates to present a variety of case stories on the subject. 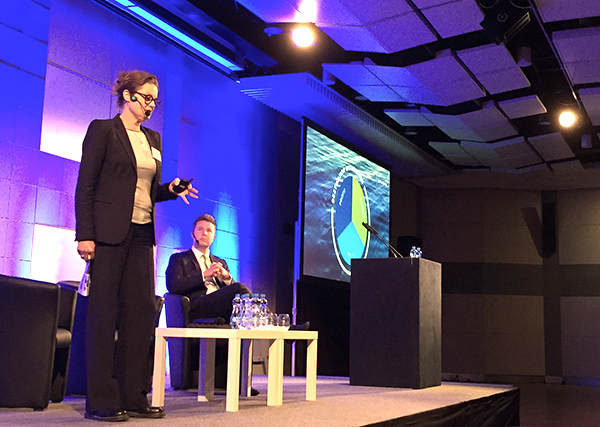 Katarina Thorstensson, Sustainability Officer at Göteborg & Co, was invited to represent Gothenburg, and as a global leader in sustainability efforts* it was only natural to share the city’s experiences. Katarina talked about the development process, from a city with high levels of pollution and environmental impact to a global leader in sustainability, where 86 per cent of hotel rooms are environmentally certified and around 94 per cent of passenger kilometres on public transport in the city are powered by renewable energy. * GLOBAL DESTINATION SUSTAINABILITY INDEX 2016. Läs mer. Published by Linda Nordberg 22 May, 2017 in Meetings. 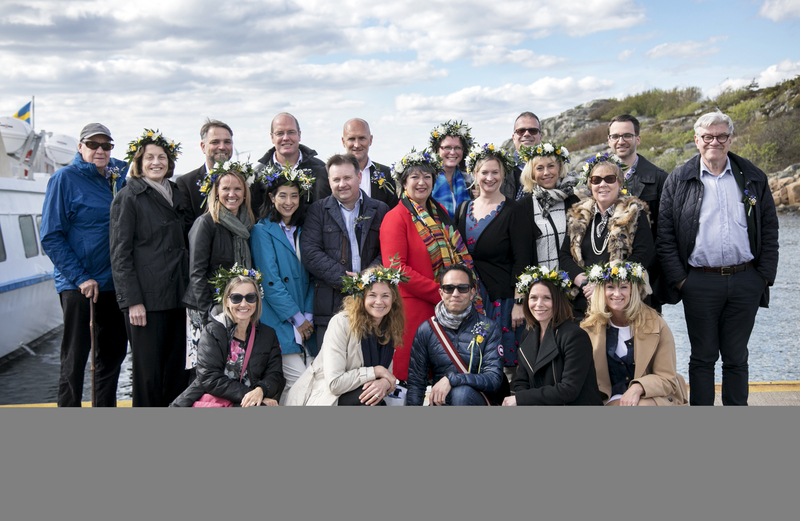 Photo: Frida Winter/Göteborg & Co.
As a partner city in the International Association of Professional Congress Organisers (IAPCO), Gothenburg was asked to host the IAPCO Council Meeting in 2017. This was an opportunity for the international gathering of meeting and congress organisers to discover Gothenburg’s appeal as a city of meetings. “We realised what great potential Gothenburg has for visitors from around the world. It was interesting to hear about the expansion plans and we can see that the city has a promising future in the meetings arena,” said Jan Tonkin, President of IAPCO. 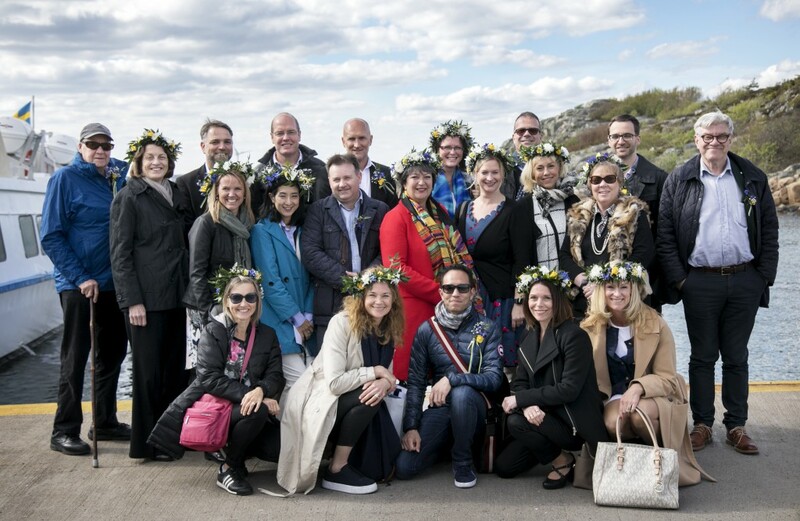 IAPCO board members from every corner of the world held their council meeting in Gothenburg on 11–14 May. They had opportunities to see the Swedish Exhibition & Congress Centre as well as the other attractions of Gothenburg as a city of meetings. 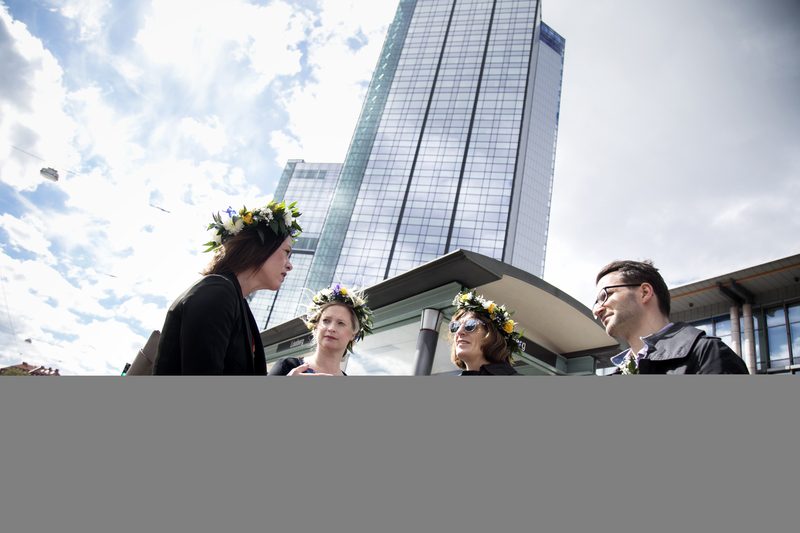 “It was a wonderful experience for us all; we not only appreciated the practicality of the Swedish Exhibition & Congress Centre, but also the beautiful green spaces that are so close to the city centre,” said Jan Tonkin. The fact that an established trade network such as IAPCO chose to hold their board meeting in Gothenburg is an important achievement in raising awareness of Gothenburg and building its profile as a city of meetings. Here, Jan Tonkin and her colleagues on the IAPCO council talk about Gothenburg’s appeal as a destination for meetings. Tagged with IAPCO, Meetings, PCO.